Ron Jeremy Wonderful mix of rums. Full body with smooth and delicate taste. Best serving straight. Chairman's Very nice aroma, smooth taste, full body with wood tobes. Smooth an full taste Vyborny rum s plnou chuti, krasna barva, lehce cokoladova chut. Krasna lahev. Don Papa Delicious rum with light cocoa taste. Winderful is straight with coke. Santa Teresa Wonderful rum with strong body, chocolate smooth taste. Really delicat! Mount Gay XO A little vanilla and chocolate taste. Nice colour. 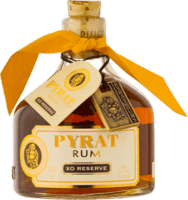 Pyrat XO Very good taste. A little bit orange taste, very smooth. The best is with small square of dark chocolate. English Harbour 5 years Very nice colour, rich flavour, little bit more hard, full body. Santa Teresa 10 Smooth body, little better to drink alone. Good for women, softly sweet. Not good for mixed drinks. Arcane Good colour, smooth taste. Little bit of coconut taste. Diplomatico Nice colour, full and strong body, better for men. Try it witch chocolate. Pusser's Good taste, average colour. The best to cocktails. Becardi select Smoother than Bacardi 8, velvet taste. Serve it better without coke, straight. Bacardi 8 Not as good as Bacardi select. Caramel taste, darker colour, better to use in cocktails. Myer's Average taste and colour. Not very tasty, good for cocktails. First of our rums This the first rum which we bought on our cruise trip in Carribean. Smooth and sweet, good taste ang clour. Very synthetic Very synthetic smell and taste, hard smell, just good for mixed drinks It stinks.